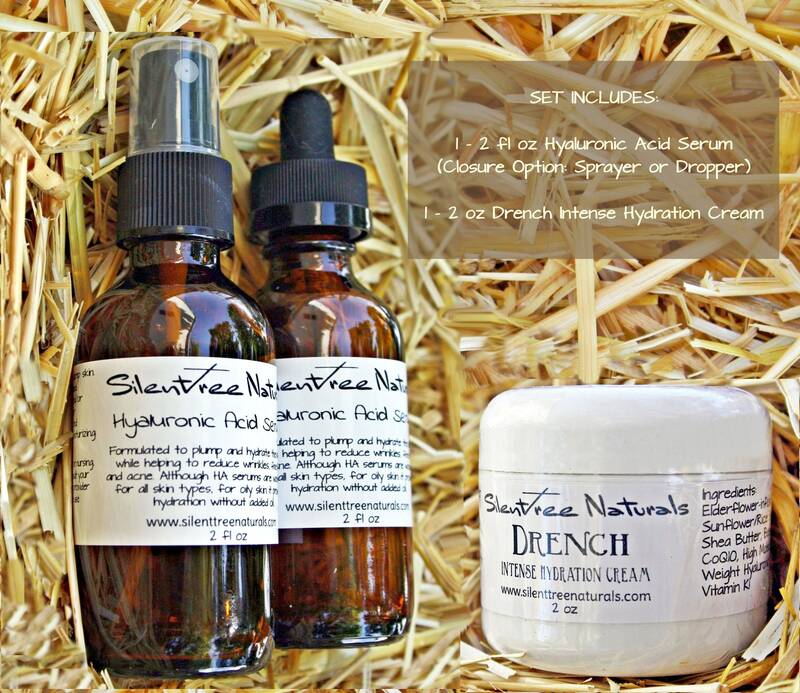 Offering Hyaluronic Acid Serum and Drench Intense Hydration Cream to provide intensive hydration and moisturizing to your dry, thirsty skin. Younger skin contains abundant amounts of water, so increasing your skin’s water content will help restore the youthfulness of your skin. Hyaluronic Acid is a natural compound serving as a viscous medium in the tissues of the body and as a lubricant in joints. It is also a humectant, which absorbs and retains moisture, capable of holding 1000 times its weight in water. When hyaluronic acid is plentiful in the skin, the skin looks plump and dewy. However, as we age and our supplies of HA lessen, our skin becomes thin, dull and less hydrated. Due to its high, relative, molecular mass Hyaluronic Acid HMW does not penetrate and instead sits of the skin surface where it binds to water to maintain hydration and cross-links with other HA molecules, to create a temporary barrier, making it very useful in helping to maintain the skin’s barrier function. This serum includes some of the best essential oils for skin tightening, rejuvenating and reducing the appearance of scars and wrinkles. The preservative used, Leucidal Liquid SF, which is approved for use with organic cosmetics, is derived from fermented radish root, thus providing a safe and natural alternative to preserving product. Although HA serums are wonderful for all skin types, for oily skin it provides hydration without added oil. A head-to-toe moisturizer that provides intense hydration while it seals in moisture and creates a protective barrier against the elements. Drench Intense Hydration Cream is a luxuriously thick and rich cream, formulated to moisturize and hydrate thirsty skin. Though created for whole body use, it can be used on the face but is better suited as a night cream for that purpose. It does takes a few minutes for total absorption into the skin, but is worth the wait. Personally, I use this every night and love it. Elderflowers have astringent properties that cause the skin to tighten and smooth. They contain antioxidants that protect against sun and other free-radical damage, plus antimicrobial and anti-fungal compounds that help keep the skin healthy. Sunflower and Rice Bran Oils are deeply nourishing oils, high in vitamins and fatty acids. Shea Butter acts as a moisturizer and makes the skin supple by providing hydration. It also helps tissue cell regeneration, softens the skin and may reduces wrinkles. Beeswax creates a barrier which helps to seal moisture into the skin. This barrier also helps to protect the skin from environmental stresses. CoQ10 is an antioxidant that may boost skin repair and regeneration and reduce free radical damage. Vitamin K1 is beneficial for reducing broken capillaries, brightening dark under-eye circles, calming redness and evening skin tone. Hyaluronic Acid (High Molecular Weight) is a natural compound serving as a viscous medium in the tissues of the body and as a lubricant in joints. It is a humectant which absorbs and retains moisture. It soothes, hydrates, and protects the skin against transepidermal water loss (TEWL) and makes for a strong and healthy skin barrier. In skincare, there is no “one-size-fits-all” solution. At Silent Tree Naturals, while we do target specific issues and offer products which may be beneficial to those issues, we do not claim to diagnose, treat or cure any conditions.